I feel like my whole life, I've been searching for that one perfect pink gloss. The one that's not too light but not too dark. The one that's not too shimmery but not too creamy. The one that looks amazing both on its own and layered over every other lipstick and lipgloss in my collection. 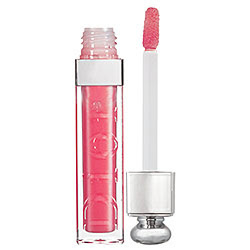 Well, I've finally found it -- and its name is Dior Addict Lip Polish in Fresh Expert. This is one of those glosses that just continues to look more and more amazing with every wearing. It gets me noticed in the best, most incredible way. For example: I layered it over my M.A.C Cremesheen Glass in Looks Like Sin over the weekend -- and my friend Susan's husband said, "Your lips look so good, Jamie! You're totally rocking the wet look -- in the best way." If a straight guy notices the perfection of a gloss, you know you've done something right! Dior Addict Lip Polish retails for $31 at sephora.com.